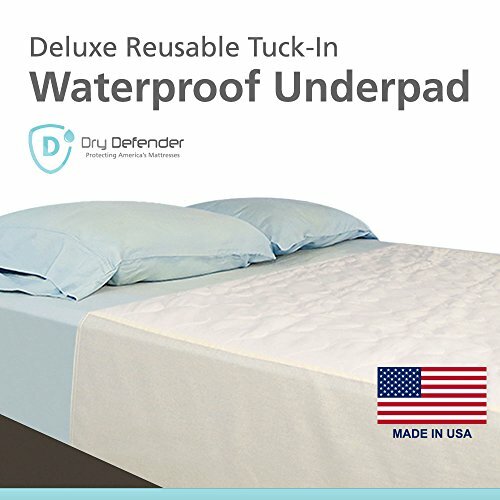 Defend Your Mattress from Fluids Using Dry Defender Mattress Protectors! Stops fluids like sweat and urine in their tracks! Ever see unsightly stains on your mattress when you take off the sheets? The Dry Defender Underpad Mattress Protector will prevent those unwanted stains from ever forming. Great for kids with bedwetting or incontinent adults alike, the Dry Defender Washable Waterproof Mattress Protector Underpad will prevent urine, sweat, and other fluids from penetrating into and ruining your mattress. Soft, top layer means you won't sacrifice comfort The top layer of this mattress protector is made of so you can sleep on it directly. Under the layer is the absorbent layer that is capable of containing up to 6 cups of liquid. This absorbent layer, combined with the waterproof vinyl layer ensures your mattress will stay dry without giving up comfort. The waterproof vinyl layer is woven into the fabric to make it silent as well as soft. Flat style overlay is very easy to use Simply lay it over the top of the sheet and you're all set. This extra large 36" x70" underpad with 18" Tuck-In wings is the perfect size to protect your Queen sized mattress from damaging wetness. The 18" wings make this underpad great for sleepers that move during the night! Made in the USA and backed by a 5-year warranty! Each Dry Defender Underpad is crafted in the United States and backed by our outstanding 5-year warranty. American craftsmanship ensures each underpad is guaranteed to last through at least 200 washings! Can be washed on warm, tumble dry on low and remove promptly. SOFT & COMFORTABLE - This Dry Defender mattress protector keeps your sheets and mattress dry without sacrificing comfort. ALL AGES - Great waterproof mattress cover for both children with bedwetting and incontinent adults. HOLDS UP TO 6 CUPS - Absorbent layer holds up to 6 cups of fluids, which is more than an adult bladder! 100% WATERPROOF - Plastic vinyl layer is woven into fabric for a soft, silent, and dry sleeping experience. If you have any questions about this product by Dry Defender, contact us by completing and submitting the form below. If you are looking for a specif part number, please include it with your message.